Nearly two years ago, we posted an informative and rave review of gDiapers, the planet’s first flushable diaper; and they received Inhabitots Founder Jill Fehrenbacher’s highest recommendation for a green hybrid diapering option. 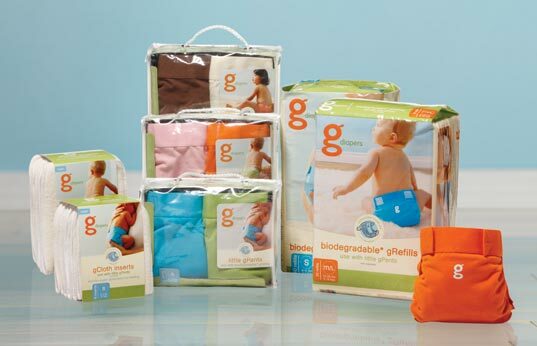 As the gDiaper collection has expanded, we’ve brought you all of their latest news, from gCloth washable diaper inserts, fashionable new gPant styles, and the latest addition to the line, biodegradable gWipes baby wipes. We were delighted to have the opportunity to present the five questions we ask all of our favorite green designers and eco companies, to Kim Graham Nye, co-founder of gDiapers. Read on for the scoop on how gDiapers got its start, and to learn about the character traits already prevalent in her toddler years that enabled Kim to spearhead this start-up company that is helping to save the planet one tush at a time! 1. Where did you come up with the idea to start gDiapers? 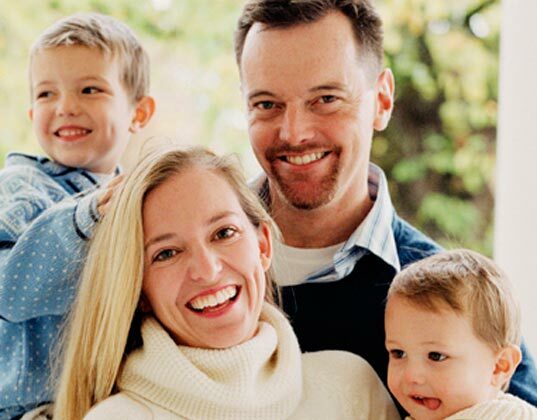 Kim: When I was pregnant with our oldest son Fynn, my husband Jason and I began researching eco-friendly diaper options. We were surprised that there were still only 2 options — cloth and disposable. And then we found a third option. It consisted of a reusable diaper cover that could be used with either cloth inserts or fully biodegradable inserts. It seemed to Jason and I to be Australia’s best kept secret! If we, as parents, were wondering why there wasn’t a better choice for diapering, we were confident that the rest of the world would want to know about this too. It was a secret that just had to be told. So we negotiated the rights, created a brand, raised some seed money, and brought the concept to the U.S. With the grassroots help from our gMums (our most dedicated customers) helping to spread the word, we’ve had a great few years. Kim: Green is more than just driving less, composting more, and changing your light bulbs. It’s about getting to a point where it’s no longer just a consideration that I should choose to buy in bulk and avoid individually-packaged goods, it’s just habit. It’s just done! A green lifestyle approach is holistic. It’s remembering that first and foremost we are temporary residents on a beautiful planet and we need to care for this space with as much attention to detail as we give to the care of our own children. Cliches aside, it’s our focus on sustainability for the sake of every person, every animal, and the home we have on earth. 3. What (toy / possession / thing) did you most cherish when you were a kid? Kim: I had a stuffed monkey. I would take him on safari with me in the backyard. Funny that later in life I would actually spend a good deal of time in Africa. It wasn’t quite like being on safari in my backyard with my stuffed monkey. 4. What three adjectives would you use to describe yourself as a tot… as a grown-up? Kim: Gosh, well as a tot I’m sure my parents would have described me as adventurous! And I was very focused on social justice and fairness. I’m not sure what the adjective would be for that, perhaps socially concerned, like “why does this person have this and that other person doesn’t?” And the third would probably be chatty. As an adult I don’t know that much has changed. Taking on a start-up company while raising two kids is definitely an adventure! I’m still chatty, still socially concerned. The gTeam would probably have to add that I’m very emotionally-invested (Jason, my husband, calls it “leaky,” — I tend to unleash tears under just about any emotional circumstance). Kim: I wanted to be so much! In fact I was just telling my youngest, Harper, the other day that when I was a kid I wanted to be a surrogate mother for zoo babies. I also wanted to be the first female Canadian prime minister, the head of the United Nations, and, oddly, a nun. I didn’t anticipate that I’d be running an earth and family-friendly diaper company, but the connections are there. 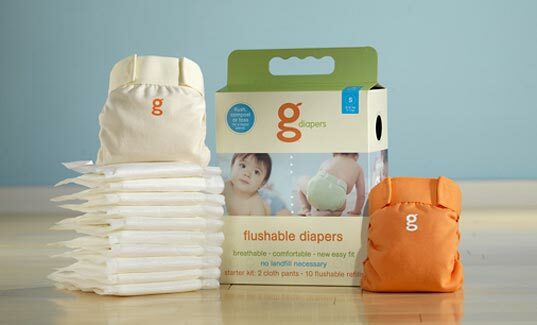 Nearly two years ago, we posted an informative and rave review of gDiapers, the planet's first flushable diaper; and they received Inhabitots Founder Jill Fehrenbacher's highest recommendation for a green hybrid diapering option. As the gDiaper collection has expanded, we've brought you all of their latest news, from gCloth washable diaper inserts, fashionable new gPant styles, and the latest addition to the line, biodegradable gWipes baby wipes. We were delighted to have the opportunity to present the five questions we ask all of our favorite green designers and eco companies, to Kim Graham Nye, co-founder of gDiapers. Read on for the scoop on how gDiapers got its start, and to learn about the character traits already prevalent in her toddler years that enabled Kim to spearhead this start-up company that is helping to save the planet one tush at a time!